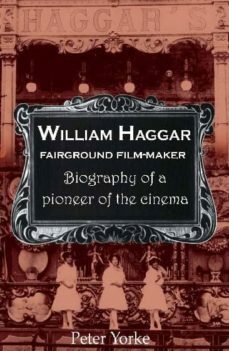 Biography of William Haggar, a pioneer of the cinema.Written by Haggars great-grandson, the book draws on oral reminiscences, unpublished family memoirs and contemporary press reports. It tells the rags-to-riches story of a travelling theatrical who became one of Britains select band of pioneer film-makers. Containing information on Victorian portable theatres, fairground bioscope shows and Haggars films, it is a "must" for anyone interested in the popular entertainment of 100 years ago. Contents: - Ten chapters deal with Haggars life (1851-1925) from his birth at Dedham, Essex, via forty years of travelling with portable theatres and his own Bioscope Exhibition, to respected retirement in Aberdare, South Wales. The last chapter relates the subsequent rediscovery of his films and the recognition of their pioneering quality.- Illustrations include contemporary family portraits, photographs of his huge ornate bioscope sh ow-fronts and stills from his films.- Eight factual appendices provide supporting lists and descriptions of plays and films; and the full texts of particular newspaper articles alluded to in the main narrative.- Notes on sources of information, references and other details.The author, William Haggars great-grandson Peter Yorke was educated at Queen Elizabeths Hospital, Bristol, and Pembroke College, Cambridge, graduating in Classics in 1960. Much of his working life was spent representing the University of East Anglia, Norwich, as client to architects, consultants and contractors constructing the then "new university". Retiring in 1996 and moving to Dorset, he has researched his great-grandfathers life and times, travelling throughout England and Wales and to Australia to meet his Haggar relatives to consult their memories for inclusion in this book.